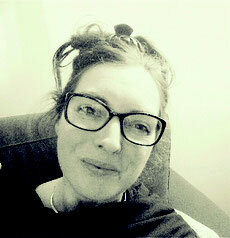 Adventures in public speaking - Website of lorrainewilliams! Public speaking is something I began while still a teenager - in fact I won cups for it at school, I was never backwards at coming forwards, as they say. Throughout my career it's been a skill that has frequently come in handy, it's something I enjoy and I'm told I do it well. Learning young, that when standing behind a lectern with wobbly little legs, the audience can't actually see that you're shaking - and that if you breath slowly and speak from your diaphragm you will come across as authoritative and calm, well that was a useful early lesson that has stood me in good stead ever since, in many different circumstances. I'm pleased to say I haven't had the wobbly legged syndrome for a long time, I'm entirely confident these days, whether I'm talking in front of a large or small group. I'm told I'm clear, authoritative, fluent, good at building rapport with an audience and even entertaining at times. If you need someone to chair an event, give a talk or lead a group - or if you need someone to run a training course on public speaking or presenting for your team - I might be just the person you're looking for. The first time I ever wore a suit - when at age 16 I spoke in the baroque surrounds of Glasgow City Chambers as part of a regional public speaking competition, coming second, to my eternal chagrin - I fluffed part of the speech - but still got a great buzz from the experience and recieved excellent feedback which gave me a lot of confidence for the future. My Dad took a fantastic picture of me mid speech, I looked fierce! Flying a group of advertisers and their agencies out to Nice in my twenties, to give them a talk on the benefits of targeting European Business Class passengers through the magazine I was publishing at the time for the airline, British Midland. Addressing 170 charity chief executives at the British Library Conference Centre in 1999, on why they needed to take the internet seriously and how it was going to change the face of fundraising, which of course, in time, it did. Speaking to an audience of more than 500, on behalf of Cancer Research UK, at the Savoy in London, where the entertainment was the Royal Marines Marching Band in full regalia, as a guest of the Air Vice Marshall George "Larry" Lamb and his wife. A glittering evening I will never forget which raised a very considerable sum for the charity. Sharing a stage with comedien Catherine Tate (who was amazing and very friendly, a total hero), addressing around 350 guests of Barclays Bank at another top London hotel for another very successful fundraising event. Chairing (as well as organising) regular three hour patient information events for the British Thyroid Foundation in London, with groups of up to 100 attendees and a mixed programme including expert speakers and break out discussion groups. 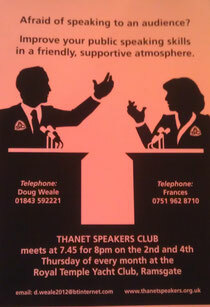 Yesterday I went to check out Thanet Speakers Club as I thought it would be helpful to meet other local speakers and to have the chance to practice and develop my public speaking abilities, as well to help others who have an interest in doing the same. As well as being in a stunning location, it was great fun and well organised, with a good mix of attendees, some very experienced and some less so, aged from 19 to well over 60, almost as many women as men, including a very able female president who gave a fantastic, informative and entertaining impromptu talk on Winston Churchill.